Many patients from the Dothan area take the 90-mile drive to Thomasville for their cosmetic dentistry because of the reputation of Dr. Oppenheim. He is an Accredited Fellow with the American Academy of Cosmetic Dentistry, meaning that he has attained the highest standard of excellence in cosmetic dental care. 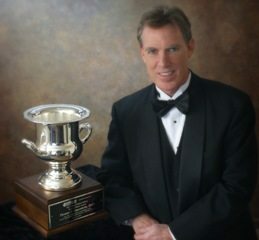 His beautiful cosmetic dentistry is recognized across the country by his fellow cosmetic dentists-he has won gold medal and first place awards in the American Academy of Cosmetic Dentistry smile gallery competition for ten years in a row, and his work has been featured on the cover of the Journal of Cosmetic Dentistry an unprecedented eight times. Patients who recognize his skill and artistry come to him from around the world. Everyone that graduates from dental school is a general dentist, and most of them also claim to be cosmetic dentists. But there is a great difference, which we will explain here. The best way to explain the difference is with photographs. The patient, however, didn’t agree. In fact, she was so unhappy that she paid thousands of dollars to have it done over. Notice the problems—The color of the teeth is flat and kind of yellow. They are opaque. They don’t sparkle. From a distance, there appear to be dark triangles between the teeth. And their shape is more like Chicklets than natural teeth. And below is another photograph. This one is of a re-do by a highly artistic cosmetic dentist in our referral network—Dr. Thomas Oppenheim of Thomasville, Georgia. Notice that her smile is now warm and inviting, as opposed to the cold, clinical look created by the general dentist. The teeth are translucent and natural-looking. They are whiter. They truly sparkle. They have subtleties embedded in their shapes and the coloration to make them look real. The patient, was of course, thrilled with the results. Click here to see more photographs of cosmetic dentistry mistakes re-done by mynewsmile network cosmetic dentists. Here’s the basic problem: Cosmetic dentistry is not a legally recognized specialty. This means that there is no restriction on a dentist saying that he or she is a cosmetic dentist. So, many dentists take advantage of this lack of a legal definition and claim to be cosmetic dentists. And I believe that they are usually innocent in this claim. They think that they have learned in dental school how to use composite fillings and how to do porcelain-fused-to-metal crowns which are white on the front, and they feel capable of addressing appearance concerns with patients. Read letters that we have received from disappointed patients about cosmetic dentistry mistakes. However, doing cosmetic dentistry properly requires extensive extra training that can take years. This means a heavy commitment of time, money, and energy for the dentist. And, if dentists can announce themselves as cosmetic dentists without this training, why should they go through all of that expense, travel, and time away from the office? A cosmetic dentist is passionate about the appearance of the work and getting it to look as beautiful as possible. General dentists have a much lower expectation of “beauty” in dental work. Cosmetic dentists are very attuned to the patient’s perception of the work. General dentists are trained in dental school that they are the best judges of what is best for the patient. Cosmetic dentistry, however, is the art of addressing the self-perception of the patient. A cosmetic dentist knows that if the patient is not pleased with the appearance of the work, the case is a failure. This goes directly against the grain of dental school training. It is not uncommon, when a patient addresses cosmetic concerns with a general dentist, that the dentist will say that there is nothing wrong with the patient’s teeth, or he or she may emphasize the risks of the treatment, and really not understand the depth of the patient’s concerns. The general dentist should be applauded for his or her honesty, but the patient needs more than that. General dentists are trained to fix things. Cosmetic dentists are trained to create things. General dentists tend to have the mindset of a technician—giving their attention only to detail and to function. Cosmetic dentists, to be successful, also must have that great attention to detail, but must have that added spark of creativity and attention to beauty. It’s like the difference between a building contractor and an architect—it takes a completely different personality type to succeed with each dimension. Cosmetic dentists must dedicate themselves to extensive hours of education after dental school, knowing that it isn’t required, simply for the passion of being able to create smiles of beauty. There is a certain “fire in the belly” that they possess. The tooth-colored materials that cosmetic dentists work with have properties that are very different from the materials generally taught in dental schools. There are opaquers, tints, composites of varying translucencies and surface characteristics, complex bonding agents, various porcelains, etc., that require a great deal of training to master. There is a chemistry of bonding that they have to thoroughly understand. Different materials have different properties of texture, color, translucency, strength, and polishability, and these all have to be manipulated to produce a beautiful and natural result. The concept of smile design is an artistic subject that general dentists, just as a matter of personality, have great difficulty with. But cosmetic dentists learn this art, the elements of beauty in a face and in the shapes and alignment of the teeth. It is difficult to teach this subject to someone that doesn’t have the aptitude. It takes more than attending lectures to learn the many aspects of color that a cosmetic dentist needs to know—he or she needs some hands-on training in this subject. Tooth color is very complex. Not only are there multiple colors in one tooth, but there are many variations in depth of the color. Some tooth colors are on the surface, some are just beneath the surface, and some are deep within the tooth. Color is influenced by reflectivity and texture—how shiny a surface is changes the color perception of that surface. Even contours can alter color perception by creating lines and spots of reflection. But the most difficult issue for general dentists is translucency and opacity. Teeth transmit light besides reflecting light, and to make a tooth look natural, the dentist has to master this understanding of degrees of translucency. There are differences in translucency between one tooth and another, and even within the same tooth there are great differences, and the way tooth translucency interacts with tooth color is very complicated and takes time and effort to master. Finally, there is a great art of communication in great cosmetic dentistry. The dentist has to take all of this artistic and scientific knowledge and apply it to the perceptions of the patient. General dentistry is a matter of diagnosing what is wrong with the tooth—decay, infection, cracks, or other structural problems, and then simply fixing them. However, a cosmetic dentist diagnoses the self-perception of the patient and then addresses that. If a patient is satisfied with his or her smile, then there is no cosmetic dental problem. If a patient is not satisfied, then the dentist has to determine what to do to create that satisfaction and meet the patient’s needs. It’s a different level of communication, and it requires considerable training and experience to master. How many of the dentists who claim to be cosmetic dentists actually are? It may be impossible to say, but I’ll give my best guess. From what I have seen, and from what I know of the dentists who have pursued extensive additional training in cosmetic dentistry and have shown a level of skill that I would consider acceptable, I would guess that it’s some number under 2%. That’s as close as I’d like to guess, and it’s my personal guess. Fewer than one-quarter of one percent are accredited in cosmetic dentistry. So how do you tell if a dentist has had the proper training to be a fully qualified cosmetic dentist? It’s difficult for the consumer. Dentists may be able to cite courses that they’ve attended, but, as a patient, you would probably have no way of evaluating whether these courses are adequate to prepare the dentist. Even if they show you photographs, my experience is that most patients miss seeing the subtleties that make a smile look truly natural and beautiful. Complicating the issue for the patient is the lack of appreciation even by many dental authorities of the requirements of real cosmetic dentistry. Thus, when interviewed by The Wall Street Journal for an article about the poor quality of much cosmetic dental work that is being done by general dentists, the spokesperson from the American Dental Association disagreed with all of the cosmetic dentists who were interviewed and said that current ADA guidelines and state regulations provide “sufficient oversight for the protection of the public.” To make a statement like that he has to believe that if the dentistry is functional, then it’s acceptable. He fails even to see the problem. Cosmetic dentistry is very different from general dentistry, and, if we are to please the patient, it can’t be judged by the same standards. See Dr. Hall’s blog postings where he answers questions from visitors about choosing and finding a cosmetic dentist. Click here to ask Dr. Hall a question yourself, to receive an email answer. Read about all porcelain crowns and the difference between them and porcelain fused to metal crowns. Find out how you can have a crown that perfectly mimics a natural tooth. Find out about Invisalign invisible braces – how you can have your teeth straightened without wearing ugly, uncomfortable brackets and wires. Learn all about teeth whitening.